If you are a regular reader you know I'm a huge fan of the American psychologist and philosopher William James. 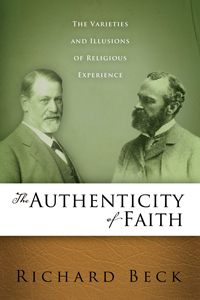 In fact, James's most famous work--The Varieties of Religious Experience--plays a key role in my most recent book The Authenticity of Faith. The part of The Varieties that captivated me so many years ago is James's descriptions of what he calls "the two families of God"--two distinct religious experiences James called the "healthy-minded" and "sick soul" experiences. James goes on to distinguish between two different origins of healthy-mindedness. The first is a dispositional, trait-like healthy-mindedness, an optimism and positive affectivity that is rooted in a person’s innate psychological wiring--the sort of congenial good-cheer many people seem to have. By contrast, there is also a more decisional sort of healthy-mindedness, an active choice to see the world as good where, according to James, a person “deliberately excludes evil from [the] field of vision.” This isn't as easy as it sounds. As James notes, an extreme healthy-minded stance may be “a difficult feat to perform for one who is intellectually sincere with himself and honest about facts." In contrast to the experience of healthy-mindedness James goes on in The Varieties to describe the second of the "two families of God"--the experience of the sick soul. The resurrection, from a Christus Victor view, is a hopeful consolation to my sick soul. The idea that love triumphed (and triumphs, eventually and always) over evil and death helps me to make some sense of suffering in this life. I'm a bit confused, isn't the point of faith that it allows us to face death/evil/melancholy with optimism? And doesn't James recommend healthy-mindedness, as the opposition healthy vs. sick suggests? By contrast, the New Atheists relabel the same opposition delusion vs. realism and often say that they "would rather face facts than be happy"...? Great questions. The Authenticity of Faith is my attempt at some answers. Any news on the Kindle version, Richard? Yes! Got a not from the publisher that it should be showing up in a few days. I'll put up a post when it happens. I've only read excerpts from Robert Augustus Master's book, titled Spiritual Bypassing: When Spirituality Disconnects Us from What Really Matters, but it seems similar to James' description of the healthy-minded Christian. The recognition of death has troubled--and on plenty of occasions has terrified--me since I was in late elementary school. (Part of it stems from my ambivalence toward what follows death. Annihilation means death and evil win, rendering everything else ultimately pointless; the thought of eternity though--even spent in whatever heaven would entail--scares the hell out of me.) As an adult, I've had a handful of episodes (usually a few days in length) in which the anxiety forced its way into seemingly every thought. I'd be carrying on conversations with friends and thinking the entire time, "I'm going to die some day." I'd be in crowded public places and think, "Eventually everyone here will be dead." Even when the "soul sickness" isn't acute, it often has a way of tainting joy. Last weekend I laughed and played with my children as they delighted in the time-honored euphoria of playing in the backyard in the sprinkler and kiddie pool. And yet in the midst of that moment, I felt a pang of sadness that the moment wouldn't, couldn't, last and that one day my children's innocence would fade, that they, too, would know life's bittersweetness. I agree with James' suggestion that a sickness of the soul may be "possibly the only openers of our eyes to the deepest levels of truth." But I wonder if my agreement is little more than a rationalization of my melancholic disposition. Undoubtedly, the optimism of some healthy-minded believers is a defense mechanism, yet I've known people who don't offer glib dismissals of evil and suffering, who possess a great deal of empathy, and still affirm a deep hope. I know non-Christians who seem perfectly at peace with their mortality, too. I confess that even if my soul-sickness affords me a "profounder view of life," there are plenty of times I wish I were one to embrace joy and nothing else. Be careful, Jason. Normal people will call you a "buzz kill", and they will avoid you. The day my only child was born was one of the happiest of my life. And yet, in the midst of my joy this thought popped unbidden into my consciousness: "Someday this person -- now so new -- will be laying in a coffin". I was deeply ashamed that I could even think such a thing, but there it was. I dealt with it. Life goes along in its routines and rituals, and yet each day there is some pain, some distress, some sorrow, some upset, and we must stop and somehow handle it on many levels. The default of this life is sorrow and pain. I do not know why. But I DO know that only those who recognize it are the people I can trust with my own level of sharing, on either my terms or theirs. Because only they are the honest ones. For the rest I feel only pity. Sam, somehow I've managed to avoid the "buzz kill" moniker. Maybe I mask my melancholy around people I fear will label me as such. I'm grateful that I'm a member of a church (a quasi-house church) whose members either have a perspective akin to mine or at the very least understand that such people exist and don't aim to be Debbie downers. I can relate to the story of your child's birth. I have very similar thoughts sometimes, and it grieves me. I am hesitant to suggest only the sick souls are honest. Sure, I'm inclined to think so, but as I mentioned earlier, I wonder of part of that isn't my rationalizing of my emotions. People routinely engage in that sort of rationalizing. My disposition goes hand in hand with my questioning and doubting as a "winter Christian." I get irked by the arrogance and glibness of some healthy-minded/summer Christians' proclamations of certitude, but then I find I grow arrogant myself, proud of my more humble, nuanced worldview, certain of my uncertainty. At times I pity healthy-minded believers; increasingly I envy them. I heard last night that Walter Wink had died. Many here will appreciate his work, and a good few may well have been introduced to Wink through some of Richard's synthesis. Somehow I feel that here is an ok place to be sad this morning. I had not heard about his passing. It is sad news. Dr. Wink's work has been a great blessing to me.